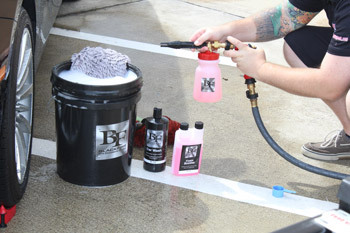 To transform any standard car wash into a foaming shampoo, simply add Foam Booster to your car wash bottle or to the car wash shampoo already in your foam cannon, foam gun, or wash bucket for an increased amount of suds produced. BLACKFIRE Foam Booster is extremely concentrated � a little goes a long way! 128 oz. Related Items - BLACKFIRE Foam Booster 128 oz.